Friday nights are not usually nights that I make an elaborate meal. After one of the most stressful weeks I can remember, I arrived home from Baltimore, and decided there was nothing I wanted more than a really good meal. I had yet another headache, so instead of running, cooking was my stress reliever of choice. So I grabbed my tools of choice for the evening, and went to work. 1) Bring broth, salt and 1 tsp Orange Ginger seasoning to a boil. When boiling, add couscous and remove from heat and cover immediately. Fluff with a fork when broth is completely absorbed. 2) I’m large sauté pan, add veggies, salt and 1 tsp Orange Ginger seasoning, and sauté. 3) Add scallops to pan, and turn regularly. After they begin to cook, add 1/4 tbsp maple syrup,sprinkle remaining 1/2 tsp orange ginger seasoning. Cook 4-9 minutes or until browned on outside, and tender on the inside (longer cook times for frozen). 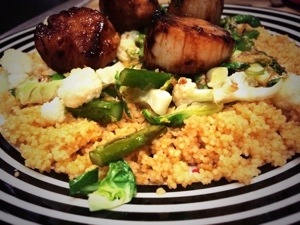 4) Serve couscous onto plate, top with veggies and scallops. Sprinkle True Lime and remaining maple syrup on top, then enjoy! Reblogged this on Tangee Taught U.
I cooked scallops this week too. I had been craving them after my trip to New Orleans. These look great.